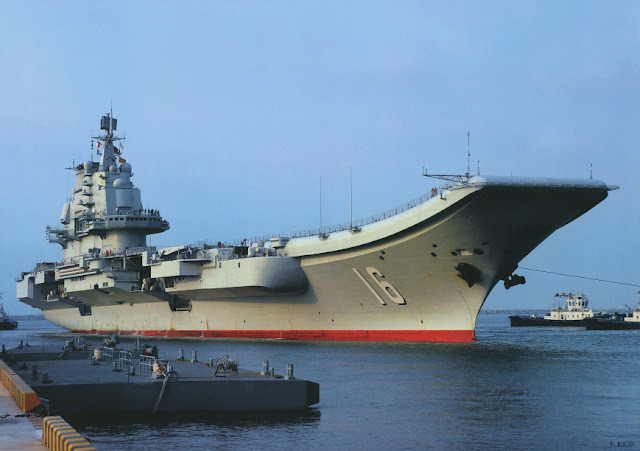 China purchased the unfinished ex-Soviet Navy aircraft carrier Varyag from Ukraine in 1998 and finally received the vessel in 2002. After some extensive refurbishments at the Dalian Shipyard in northern China, the vessel was commissioned by the PLA Navy in September 2012 and renamed Liaoning, after the north-eastern province. 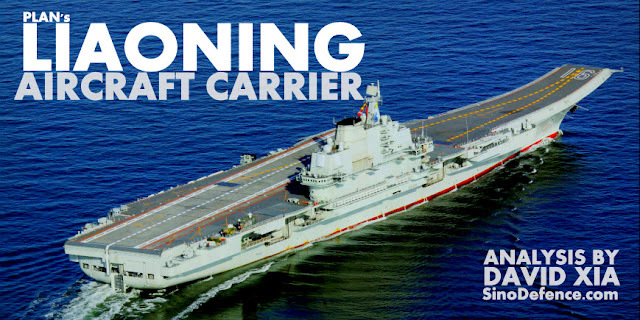 The primary role of the vessel is to serve as a training platform for the PLA Navy to gain experience in operating from a modern aircraft carrier, and to develop and perfect the relevant technologies that will be used for the design and construction of China’s indigenous carriers. 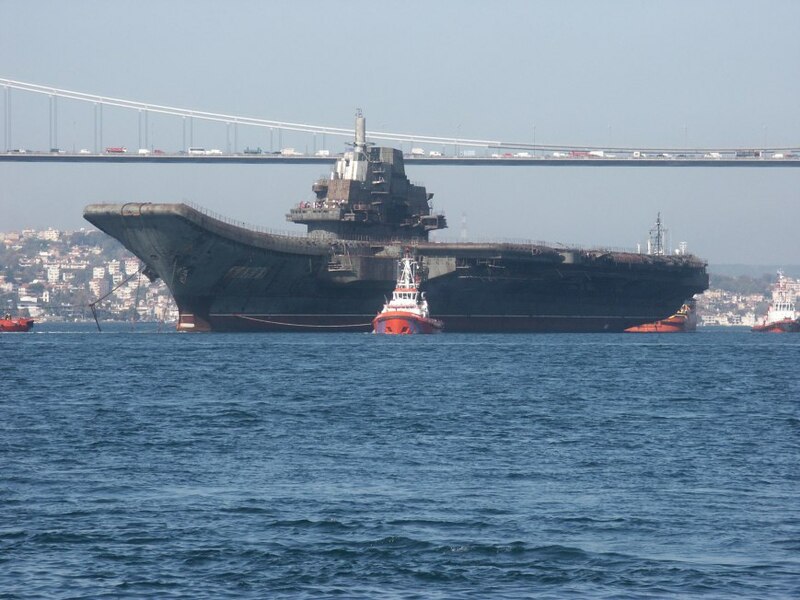 The Varyag is the second hull of the Soviet Navy Project 1143.5 (Admiral Kuznetsov class) aircraft carrier. The 67,500-tonne vessel was laid down at the Nikolayev South Shipyard (formerly Shipyard 444) in Nikolayev on 6 December 1985 and was launched on 4 December 1988. The vessel was renamed Varyag in July 1990. After the dissolution of the Soviet Union in 1991, the ownership of the vessel was transferred to Ukraine. Construction stopped by 1992 due to a lack of funding. By then, 70% of the construction had been finished. The vessel was structurally completed but without weapons, electronics, or propulsion. 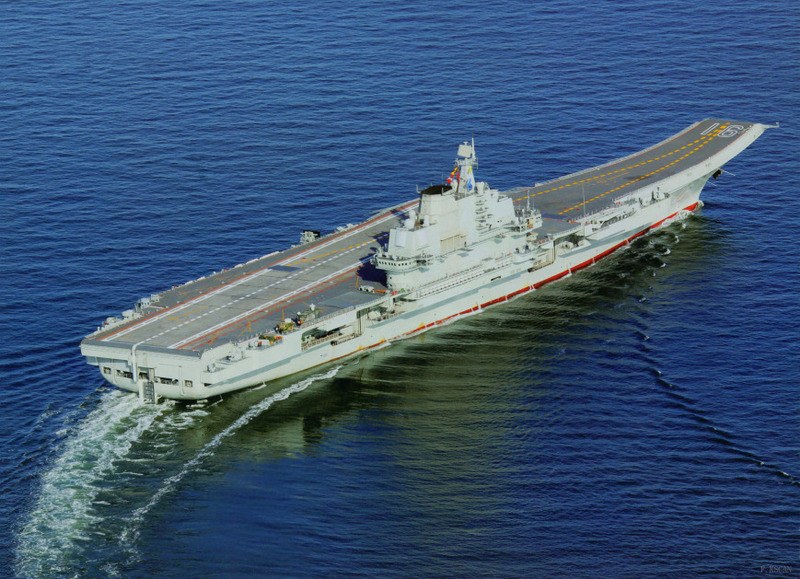 China first expressed interest in purchasing the Varyag in 1992. Chinese officials inspected the vessel stationed at the dock of the Nikolayev South Shipyard, but the negotiations was fruitless due to dispute over price. 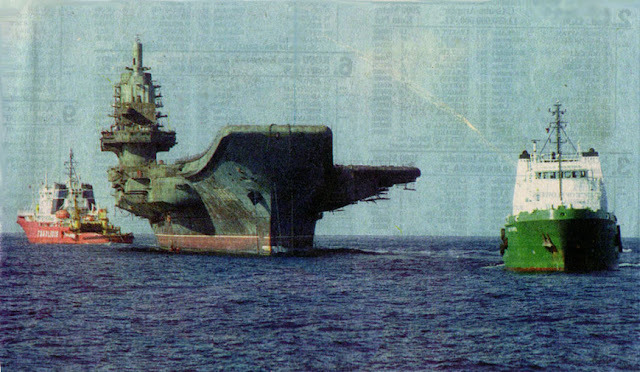 As a result, the unfinished Varyag remained at the dock unattended for six years. In the late 1990s, the vessel was put up for auction and bought by a Macau-based Chinese company for US$20 million for conversion into a floating Casino and amusement park. The contract with Ukraine prohibited the buyer from using the vessel for military purposes. Before handing the ship over, the Ukrainians striped all onboard equipment with potential military values from the Varyag. 11 years after its launch, in 1999, the Varyag finally left the dock of the Nikolayev South Shipyard, towed by several high-power tug boats on its way to the Far East. However, the vessel was refused to pass through the Bosporus Strait by the Turkish government on the ground that the unpowered vessel posed too much risk for other ships as well as facilities in the strait. The Varyag was stationed near the strait for three years. 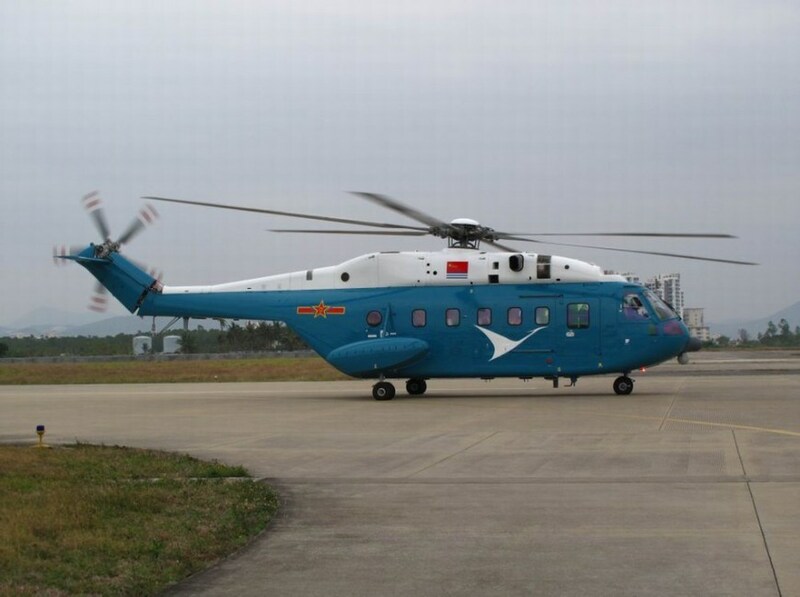 After the Chinese government intervened and handed the Turkish government US$1 million as a guarantee bond, the vessel was finally approved to continue its journey in 2002. After a troublesome journey, the Varyag finally arrived at the Dalian Shipyard in northern China in March 2002 and was stationed there under tight security. By then it became apparent that the vessel was never going to be turned into an amusement park. Instead, it was handed to the PLA Navy for research and restoration. Along with the vessel, Ukraine also handed to China all of the vessel’s blueprints and design documents. 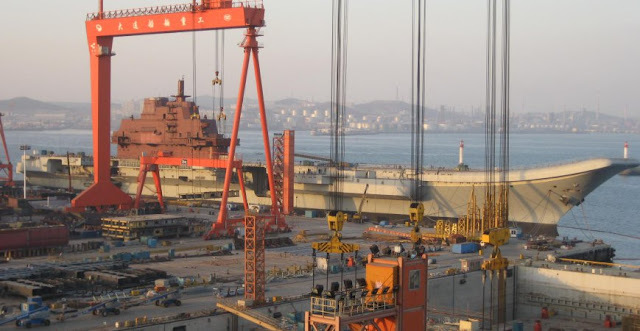 In 2005, the vessel was moved to a dry dock in the Dalian Shipyard painted in the PLA Navy grey, with scaffolding erected around. The restoration work was completed in late 2006. The aircraft was then moved to another dry dock in April 2009 to install engines and other heavy equipment. System installation commenced in late 2010. By March 2011 the island of the aircraft carrier was almost complete, with painting finished and scaffolding removed. In June 2011, the PLA Chief of Staff General Chen Bingde confirmed that China was building an aircraft carrier — the first official acknowledgement of the existence of such a project. 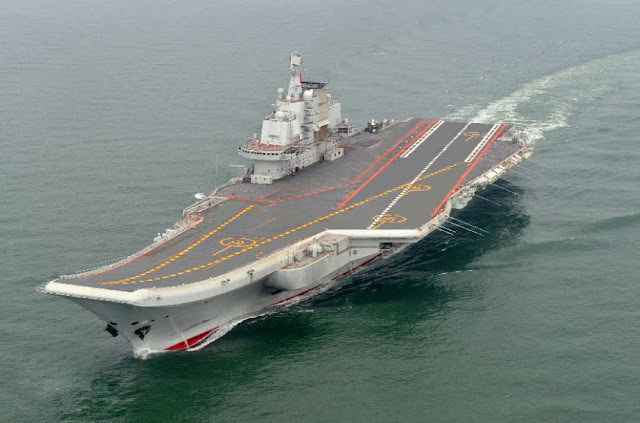 On 27 July, the Chinese Ministry of National Defence announced that it was refitting a second-hand aircraft carrier for ‘scientific research, experiment, and training purposes”. The first four-day sea trial of the vessel began in August, followed by a second set of trials in December, before the vessel was returned to the shipyard for final touches. 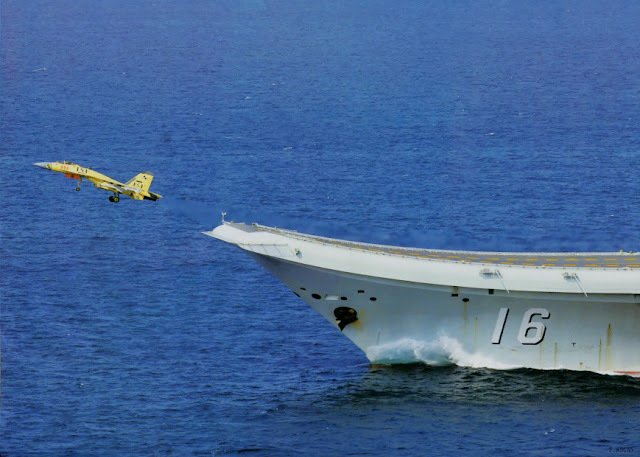 On 25 September 2012, the aircraft carrier was officially commissioned by the PLA Navy, with a new name Liaoning and hull number 16. 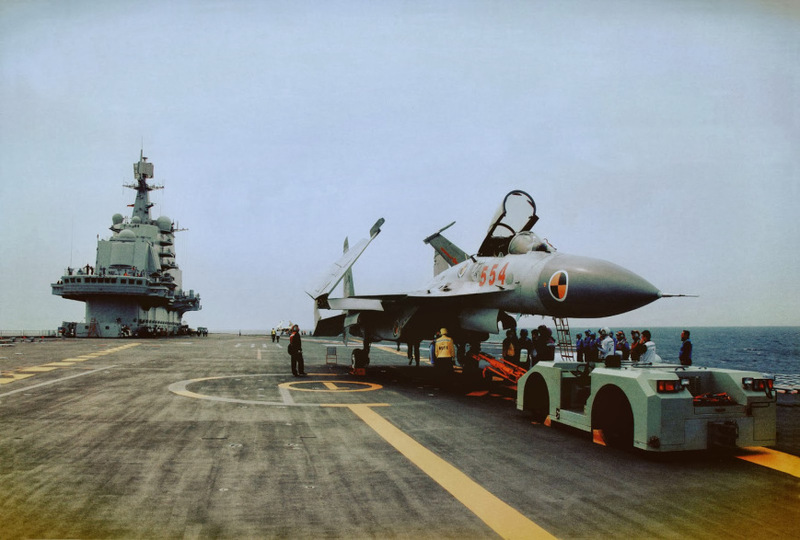 In November, the Chinese Ministry of National Defence confirmed that the PLA Naval Aviation’s J-15 fighters had successfully performed touch-and-go and arrested landings on the Liaoning. Chinese press estimated that crew training would continue for 4 to 5 years before the aircraft carrier reaches its full capacity. 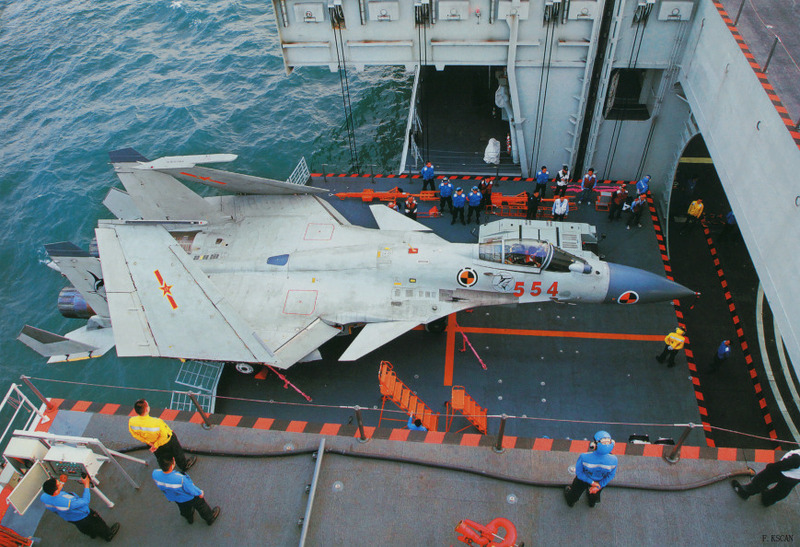 The Liaoning features a short take-off but arrested recovery (STOBAR) arrangement. Aircraft take-off is assisted by a bow ski-jump angled at 14°. The flight desk is fitted with arresting wires. 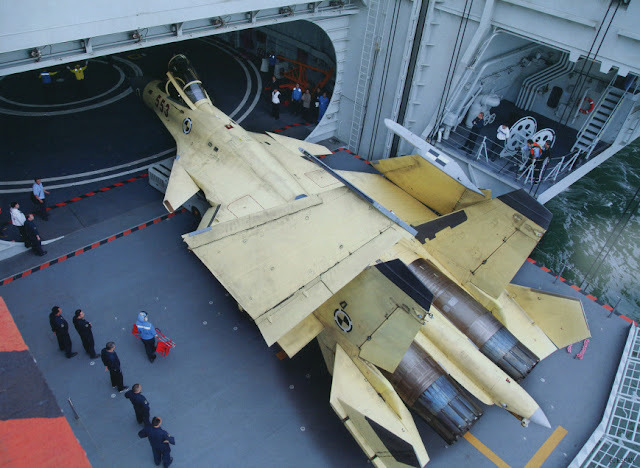 Two starboard lifts carry the aircraft from the hangar to the flight deck. 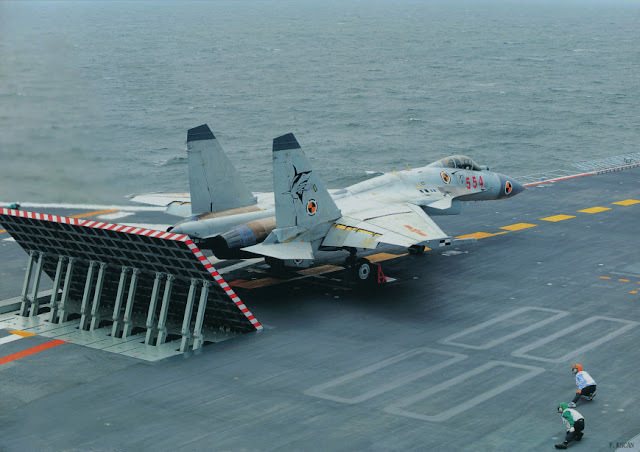 The carrier operates a number of Shenyang J-15 Flying Shark carrier-based multirole fighters, including its two-seat fighter-trainer variant J-15S. In addition, the PLA Naval Aviation has been flying several models of ship-based helicopters from the vessel, including the indigenous Changhe Z-18 transport helicopter, the Z-18J AEW helicopter, and the Z-18F ASW helicopter. The Varyag was originally to be fitted with a Granit (SS-N-9 Shipwreck) anti-ship missile system. The missile launcher was removed before the vessel was sold to China, and the launcher base was removed during the refit to give a larger aircraft hangar space. 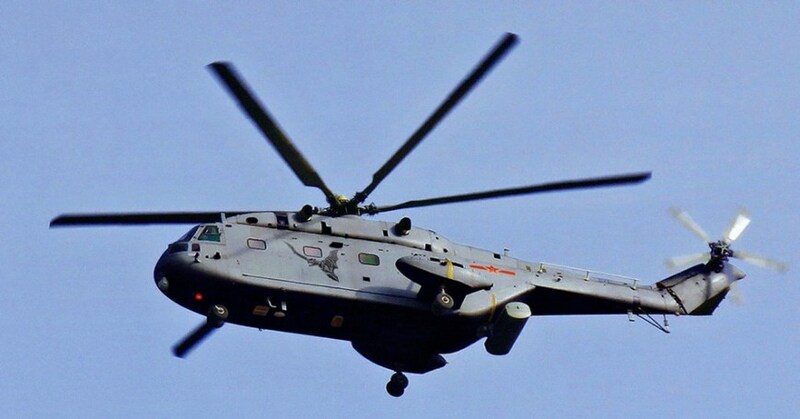 For short-range air defence, the Liaoning is fitted with four HQ-10 (FL-3000N) air-defence missile systems, each with an 18-cell missile launcher. The missile launcher is similar to the U.S. Navy RIM-116 in arrangement. Derived from the TY-90 short-range air-to-air missile, the HQ-10 is fitted with a dual passive radar-/infrared-homing seeker and has a maximum range of 9,000 m. An improved variant is reportedly fitted with an independent active infrared seeker, with a maximum range of 10,000 m.
HQ-10 short-range air-defence missile system. 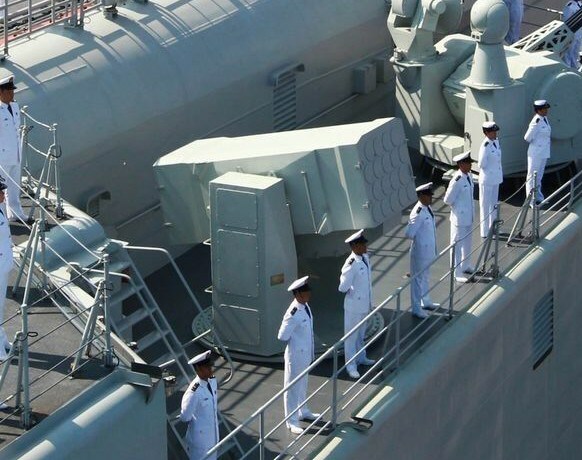 The Liaoning is equipped with four 18-cell launchers. 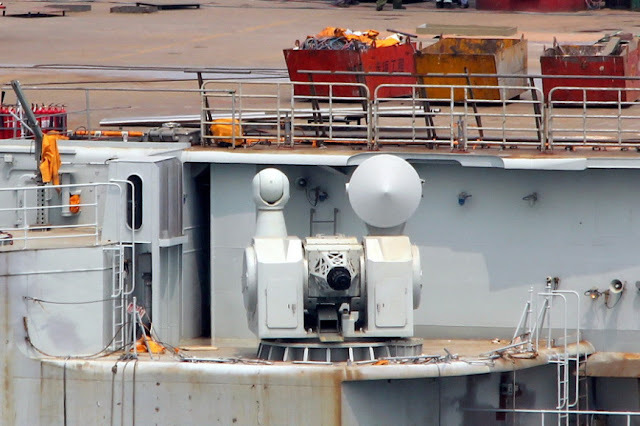 There are also two Type 1030 close-in weapon system (CIWS), which is the 10-barrel version of the Type 730 CIWS. The weapon system has a 10-barrel 30mm cannon, which is fed by two ammunition boxes each holding 500 rounds of ready-to-use ammunition. One magazine would typically hold armour piercing discarding sabot and the other high explosives. The empty cartridge cases are ejected forwards out of the lower part of the mount. The cannon is driven by external power, with a maximum cyclic rate of fire of 3,500—6,000 rounds/min. The cannon has a maximum range of 3,000 metres, but targets are typically engaged at a distance of 1,000—1,500 metres. 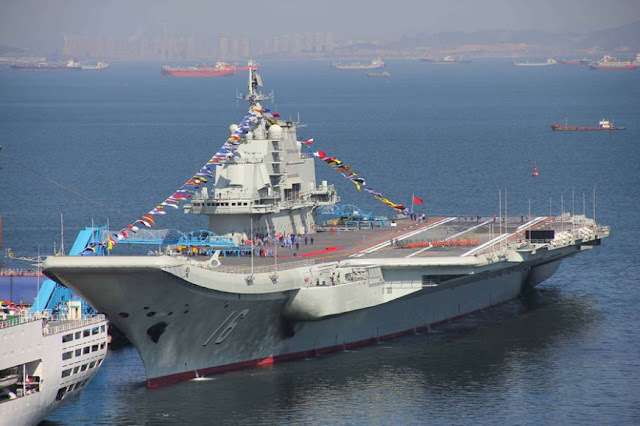 The Liaoning is conventionally powered, possibly using a propulsion system similar to that of the Russian Navy Kuznetsov, consisting of eight boilers and four steam turbines (50,000 hp each). The vessel is fitted with four shafts with fixed-pitch propellers. David Xia of SinoDefence.com and can be reached through email - sinodefenceblog@gmail.com | Thomson Reuters Researcher ID : L-1240-2015 / All Images are sourced from www.sinodefence.com and other open-source platforms.